The cause of the second type of stain – yellowish stains in the underarm area on light fabrics – don’t appear immediately after deodorant is applied but often after several washes. They won’t come out with laundry detergent anymore and they get more noticeable over time as the fibers (of the textile) harden. This can make the garment unwearable. Over the past seven years the scientists at Beiersdorf have been thinking in black and white, developing a new generation of deodorants that leave no white marks on dark fabrics and also minimize yellow stains on light-colored textiles. NIVEA’s product developers joined forces with the textile experts at the Hohenstein Institute to identify the cause of the problem. The result of the successful search is a textile protection technology, a sensational innovation that can be found in the new deodorants from NIVEA Deodorant Invisible for Black & White. With the new technology, the substances that cause staining cannot adhere so effectively to the fibers, so they’re easier to remove during washing. 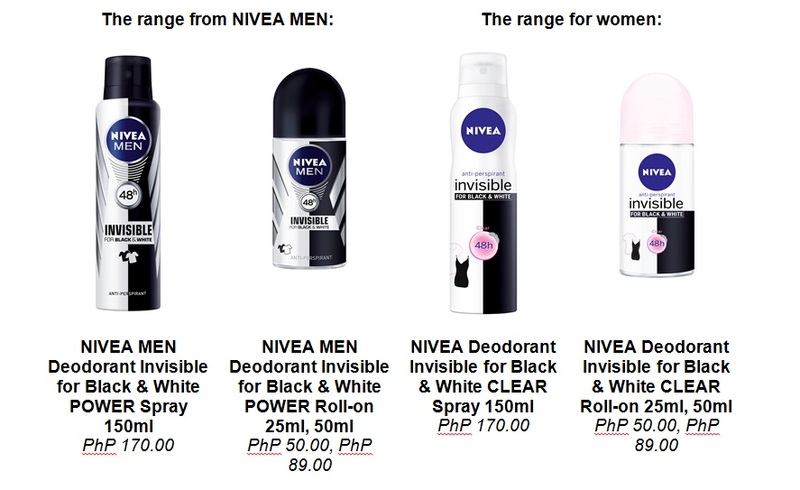 NIVEA Deodorant Invisible for Black & White – making sure black stays black and white stays white for longer, so your favorite clothes look their best. Now you can enjoy the colorful moments of life with reliable protection.